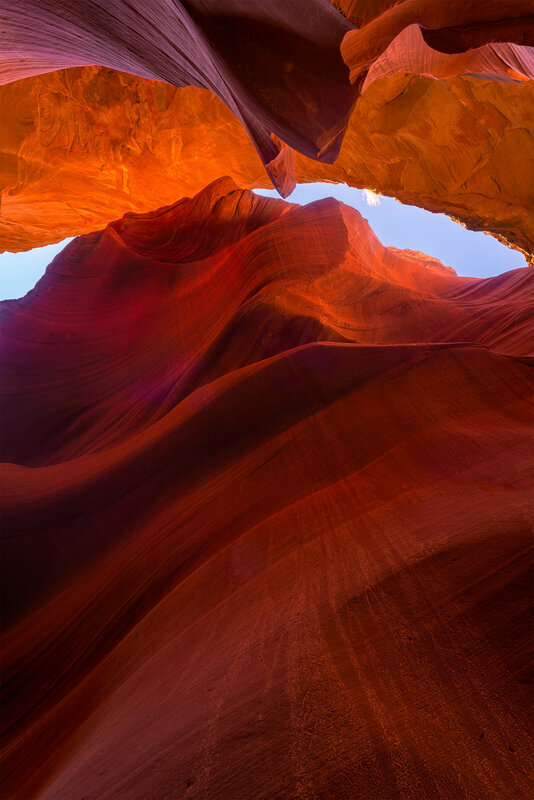 I went to Page, AZ for one real reason - to photograph Antelope Canyon. I got through one morning at Lower Antelope Canyon and having not shot a slot canyon before, there were a ton of mistakes I made that I think other photographers can benefit from knowing. First, everyone tells you it’s dusty and full of sand and you shouldn’t change lenses if you can. That’s good advice but the duh part of it - that sand will get on your lens and you need to blow it off, kind of eluded me till half way in. The sand added some nice sun flare like parts to some of the pictures, which I had a blast photoshopping out. Takeaway - bring a rocket blower and use it. Second, pointing the lens straight up in the more open Lower Antelope Canyon will lead to subtle sun flares, where patches of the image will be desaturated. I didn’t notice them in my liveview screen and they really can’t be photoshopped out completely. Takeaway - use your finger to block the very bright spots and later blend the layer in Photoshop. Third, bring a wide angle zoom lens and maybe a fisheye too. You really will be working in fisheye to 24 mm range, so you can leave everything else at home. I would have loved to take some macro shots but as part of the tour, you’re not going to have the time or space to look for and setup for macro shots. This is specific to Antelope Canyon though, if you go to some of the other less busy ones, go ahead and bring those other lenses. The other more common tips that plenty of other people have given like, go on the photography tour, only go when it’s a clear sunny day and such should be all adhered too as well. One last tip that made the whole thing way more enjoyable for me; take a deep breathe, look straight up and pretend you’re the only person there - all the pictures on the internet don’t do you own eyes justice.